In the wild, canids have been known to cover massive areas of rough terrain and inhospitable wilderness without ever needing 2 pairs of shoes to protect their paws. However, just because they don’t wear shoes doesn’t also mean they can’t. Canine footwear serves two fundamental purposes. One is to protect your furry friend’s paws and the other one is to protect your very own floor and other surfaces at home that you may not want your pooch to scratch. And if these footwear will make your pooch stand out in the crowd, then that would be a welcome plus. Functional or aesthetic or both, it is important to buy only the best dog boots for your doggie. We’ve researched the market for some of the best and we’re sharing them with you in this article. If you’re looking for dog snow boots for your pooch, you’ll love the one provided by My Busy Dog. This one comes with exceptional water resistance and anti-slip rubber soles to help provide your doggie with superior grip on ice or even on slippery floors and loose rocks. The point is that its rubberized outsoles will help keep your doggie’s paws firmly planted on the ground regardless of the type of surface it is on. The same rubber soles will help protect your doggie’s paws from thorns and even the hot pavement while keeping the paws relatively warm and dry even if your pooch wades in a puddle or walks right through mud. 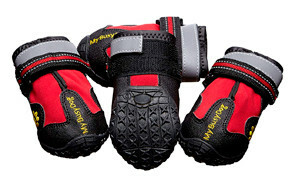 The My Busy Dog also comes with a reflective Velcro for added safety in low light conditions. You can consider the My Busy Dog canine winter shoes as an all-terrain footwear for your outdoor-loving mutt, making it the best dog boots for winter and all year round. Dog snow shoes don’t have to be expensive. This is what Petacc believes in when it designed its water resistant dog hiking boots. Cost friendlier than most products with almost similar features, the Petacc is an exceptional choice for its water-resistant construction, skid-resistant and sturdy outsoles, and flexible design to add comfort to your pooch’s feet while walking or running over any terrain, snowy or otherwise. It comes with a wide open top that splits in two for ease of wearing but are securely fastened by two Velcro straps that come with a reflective band for added safety. At any rate, you will also find the pet paw embroidery to be a cute addition to the overall design of the Petacc. For a really inexpensive yet adorable dog shoes for summer, you’d be happy to get the URBEST Puppy Dog Shoes with Detachable Closure. Made of a combination of plush fleece and luxurious looking faux leather, the URBEST comes off as a trendy and posh footwear for your furry friends. It also comes with rubber soles. However, fleece is actually not really that known for its water resistance, although it can provide exceptional softness and comfort for your pet’s paws while walking. Velcro straps secure the top of the URBEST so it stays over your pooch’s paws. The LONSUNEER Breathable Dog Boots that stay on day in and day out especially inside the home or even in the backyard is a great way to protect pets’ paws from the various surfaces of everyday things. Its outsoles are not rubberized and while these are made of faux leather these won’t offer your doggie ample protection against sharp objects, rocks, and thorns. It can also provide you with sufficient waterproofing. It’s perfect for indoor use, nonetheless, as well as a casual stroll around the neighborhood, at the park, or even in the beach. As long as you don’t let your mutt wear it over rocky terrain or spiky bushes, it should be just fine. It comes with a fully breathable mesh fabric secured by flexible Velcro straps. If it’s comfort that you want for your furry pal, this is one of your best choices. 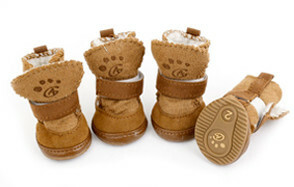 Another dog shoes that stay on is LONSUNEER’s Puppy Daily Soft Sole Nonslip Mesh Boots. It’s a lot cheaper than the LONSUNEER Breathable yet provides almost the same benefits as it technical has the same features. It comes with faux leather soles to help protect the paws of your pooch in everyday environments while providing optimum comfort with its soft and lightweight design, thanks to the use of neoprene material. It can also be used as dog snow boots as its neoprene paneling can provide significant waterproofing abilities. However, it should not be used on terrain that is littered with rocks and other sharp objects. It will keep your pet’s paws dry from spills on the floor or even in the snow. It is a very adorable footwear for pets. But if you’re after absolute protection, you’ll be better off with a fully rubberized sole. These are not dog booties for winter snow or even for a deep puddle of rainwater for the simple reason that they don’t provide sufficient waterproofing for the entire surface of the Ultra Paws. However, it does allow your pet to walk and run effortlessly on ice, slippery floors, or even hot surfaces as its outsoles have been designed for optimum traction. The Velcro straps come with foam cushion to help provide for a more secure yet more comfortable fit on your pet’s feet. The Ultra Paws is easy to put on thanks to a split seam opening. Unfortunately, it is priced rather steeply and, compared to the My Busy Dog, its limited features surely don’t justify the hefty price tag. Some would still consider it as great footwear for senior dogs, however. Made of waterproof neoprene complete with breathable mesh panel, the WuliC can be considered as great dog shoes for summer. The breathable mesh panel will keep those paws super comfy in warm weather while its neoprene and water resistant soles should come in handy during rainy summer afternoons. The WuliC also comes in 2 lovable designs, is completely hand washable, and lightweight for your pooch’s walking and running convenience. If any, you’ll love the friendly price tag as it gives you the chance to put something more fashionable on your pooch’s feet whether it is for everyday wear or for special occasions. It comes with the standard Velcro straps that are completed with reflective bands to allow for improved visibility and safety especially if you decide to take a walk in the dark. The Hilado Dog Shoes have a striking resemblance to the Ultra Paws, except for the brand name logo printed on its Velcro straps. It is not really an all-weather, all-purpose, all-terrain footwear for pets as it is designed more for protecting the paws against objects strewn on the floor or the ground. The combination of nylon and soft cloth gives it a certain degree of waterproofing but not enough to really keep the paws dry and warm. 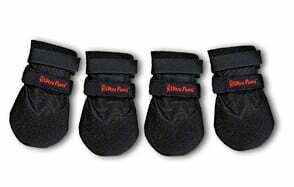 Nevertheless, the Hilado comes in more as a paw protector against potentially hazardous items on the ground so this should also mean it can give your pooch excellent traction on any surface whether it is on ice, on pavement, or even on hardwood floors. And for a price that is less than half the cost of the Ultra Paws, it should provide a more economical paw protector alternative. Buying dog boots is the same as buying human boots. The size of the dog’s feet is the single most important consideration when buying a pair of dog boots. It may be fashionable and ultra-protective, but if it doesn’t fit your pet’s feet, then everything else is for naught. Other buying considerations can include the type of material used in its manufacture, the security of its closure, the level of comfort it provides to the feet, and the weatherproofing and overall protection it affords mutts. However, these are not the only things that will have to be factored into your decision. That is why we’ve prepared this comprehensive dog boots buying guide to help you narrow down your choices. Experts say that not all dogs really do need such contraptions as this can get in the way of their natural instincts. For example, dogs are better able to run on their naked feet than if they are wearing these shoes, regardless of how well-designed these footwear are for improving traction. The tactile feedback from the ground surface is simply not there and this can somehow confuse the pooch. Nevertheless, this is not to say that canines cannot benefit from such accessories. For the most part, there are a variety of reasons why people put on footwear on their doggies’ feet. These can be generally classified in the following. Temperature extremes can be quiet a concern among dogs. An unusually hot summer day will often spell oven-baked pavements as well as sand. While the footpads of pooches are relatively thicker than those found in humans, it doesn’t necessarily mean that they don’t feel the heat of these surfaces anymore. Likewise, if you have a canine breed that is not particularly adapted to the icy cold conditions of winter, then there is a chance that they will also experience some problems on their feet. This is, of course, often in addition to the risk of injuring the feet in cases where there is sharp ice sticking out from the ground. Obstacles that may be buried in snow can also be stepped on by canids and this can lead to injuries if they don’t have adequate protection for their feet. As absurd as it may seem, putting boots on your doggie’s feet can help provide for a more comfortable walk on very hot or even very cold weather conditions. If your canine friend happens to have an injury on its feet, you will also need to protect this against further injuries. More often than not, there will be a bandage wrapped around the injury itself. You need to protect this bandage from getting loose because of your pet’s scratching or even chewing. This is critical as the bandage and the medication underneath it can help speed up the healing process. In some cases, the dog boots can come with extra padding to further provide ample shock-absorption. This helps limit the worsening of the existing injury. Just look at it as a more fashionable way to wear a cast. Booties can help protect your pet’s feet against pointed or sharp objects on certain terrains such as rocks, broken shells, glass shards, and the like. So if you’re taking a walk down the beach and there are broken twigs or sharpened edges of seashells, these won’t injure your pet’s feet. Hiking in the woods can also be risky for your pet as there can be a lot of debris like sharp twigs, ragged rocks, and others that can injure the feet. Rough bits and other debris can also be prevented from getting in between the pads, too. That is why you may also want to put on booties on your pet’s feet. Whether you want to admit it or not, having booties on your pet’s feet can help you feel more at ease about the integrity and safety of your couch, sofa, beddings, and even floors which can all be scratched by your pet. Even if you don’t have a pooch that is a tenacious scratcher, the mere fact that it will be picking up dirt and debris outside your home and bring these inside can also somehow bring harm to your floors and other surfaces. At least, having booties on will help you retain the integrity of your furnishings. If you went out for a stroll on a drizzling afternoon, chances are your pooch will be picking up plenty of mud, dirt, small rocks, twigs, and debris through its paws. Before you let them inside your home you will have to wash their feet and dry these completely. It can be a worthwhile activity, but for most of us, it’s very inconvenient. If your pet wears boots every time it ventures outside, then you don’t have to fret about cleaning up its feet later on. You can simply remove the boots and let your furry pal in. Canines that wear boots really look adorable. This is especially true if the footwear they are wearing has been customized to match their overall getup. It really is a great way to improve their appearance and boost the ego of their pet owners. One of the most important things that you need to do before you purchase a pair of dog boots is to make sure you get the right size. Here, we will describe the steps for you to choose the best-sized footwear for your pooch. Get a blank sheet of paper and have your pooch place its paw on it. Try to lift the opposite paw so that your dog’s weight will shift towards the foot that is on the paper. This is to make sure that the paw is firmly planted on the paper. Get a writing utensil and draw an outline of your pooch’s paw, making sure you accurately draw the figure. Alternatively, you can draw a line that marks the leftmost edge of the paw and another line on the rightmost edge. This constitutes the width of the paw. For the length of the paw, you will need to draw a line just at the level of the tip of the paw’s longest nail and another one at the back of the paw. Get the measurements of both the width and the length of the paw using a ruler. You can measure it in inches or even in centimeters. Once you have taken the measurements, you will need to compare your pet’s foot measurements to the sizing chart of the doggie shoes you are planning to purchase. Make sure not to generalize these measurements as different brands will often come with their own sizing charts. That means a small size on one brand may already be considered as medium size by another brand, and vice versa. Additionally, it is perfectly okay to allow for an additional quarter inch from your measurements as you wouldn’t want a really tight fit for your pooch’s feet. Knowing how to put dog boots on your pooch is equally important as knowing how to choose the right size for them. Otherwise, you’ll end up with an utter piece of junk. Here are the steps on how to put your dog shoes on your pooch. Make sure your pooch is standing whenever you have to put on its booties. This is to help ensure that its feet are well inserted into the space intended and to secure it properly. Open the top of the bootie to its fullest extent. If there are straps, make sure that these have been either removed or unfastened. Carefully insert the paw of your pet through the opening. Use your finger to assist in sliding the foot through. If the bootie’s upper is tall enough, then you will have to insert the pet’s dew claw as well, otherwise, it will be largely uncomfortable for the pooch. Raise the opposite leg so that your mutt’s weight will shift to the leg where you put the bootie on. This will also aid in the proper placement of its feet. Try running your finger through the bootie to ascertain the proper or correct placement of the foot especially at the front portion of the boot. Let your canine friend stand and try to assess the placement of its foot inside the bootie. You can lightly squeeze the toe portion of the bootie. Once you’re certain that the foot is in its correct position, you can lower the opposite leg and secure the opening with its strap. Tuck in any excess fur or hair that may be protruding outside the bootie. This gives it a neater appearance while also minimizing dirt and debris from clinging onto these excess hairs. Close the shoe and proceed on putting on the rest of the shoes. It is one thing to put dog boots on your canine friend. It’s a different matter having it get used to wearing these shoes. Here are some tips to help you make your dog get used to wearing footwear. Like all things new, it is imperative to break in the process of wearing and using these booties on your pooch. You simply cannot expect them to start enjoying the walk with the footwear the very first time you put these on them. Patience is a virtue that all responsible dog owners So be ready to train your pet slowly and one step at a time. We did mention that the absence of tactile feedback from the ground to their paws can be unsettling for pooches. As such, you can start with boots with relatively thinner soles. These may not provide you with adequate protection but it’s a good start to get your pet really acquainted with the bootie. One of the helpful tips that we’ve found is to put on the footwear on the front paws only, leaving the rear fully bare. This is to slowly acclimatize pooches to the sensation of having the feet, not in direct contact with the ground surface. Praising and giving treats to your dog can go a long way towards making it comfy in its shoes. The thing is dogs love to please their human masters. And if they can associate your praises or your treats with wearing the shoes, then they’ll be more than happy to oblige you. This is a lot similar to using positive reinforcement. Incorporating activities that your mutt love the most while wearing its booties can help reinforce the notion that the footwear IS equivalent to fun and fulfilling activities. As we have already said, dogs don’t really like putting on shoes. As such, it will take a while before they get used to it. This is where tons of patience and persistence can be exceptionally handy. Dog shoes are fast becoming an important accessory for pooches. These provide protection not only for their feet but also for your furniture and other items at home. It is therefore important to learn how to choose the best dog boots for your pooch especially its correct size. It is equally important to learn how to put these on and how to encourage and acclimatize your pet into loving its shoes.